The tournament season in Australia ends on 31st October and it is now time to prepare for the Australian Masters - invite only event that is organized for the best 12 players in the country to determine the ruling Champion for the next season. It is the second year of Kings of War Australian Masters too. This year I got very lucky to qualify and I am already looking forward to the event that will take place in Ipswich in Queensland on 3rd December! The event is one day tournament with 4 games being played and Clash of Kings 2017 in place. There is, however, one very interesting tradition that the very first game is so called Army Swap. It means that the players would play against each other but commanding their opponent's army against their own! The pairs are already determined and 1st player in the ranking is going to play against 12th, 2nd against 11th and so on. You may expect discussions on various social media about the lists and the chances of each player to win this year and I wanted to add to it a bit as well. However, I decided to go for armies and players presentation. The main reason is that I think the players and their armies deserve it after the full year of campaigning as qualifying to Masters is a success already. In addition, I think the event itself is worthy talking about as it further promotes a fantastic game of Kings of War. And while naturally it is going to be a very competitive event, there is so much more to it! I decided to start with 12th player in the rankings and I will do my best to present each army before the event! I think League of Rhordia is the only faction I have not had a chance to play against yet! It is a very intriguing army with a lot of varied options so that it does not need to choose a single style of the warfare. League of Rhordia has army wide special rule: Supreme Command which means that all sources of Inspire are Very Inspiring. 2 x 6 Honour Guard - The majestic Aralez live out on the plains in small family groups. Often mistaken by the ignorant for chimera, these large dog-like beasts are well known for their unique ability to heal minor wounds by touch. Many adventurers, lost and exhausted in the wilderness, tell of an Aralez coming to them in their dreams and afterwards waking fully refreshed, their scrapes and bruises healed. An Aralez can be fiercely loyal and the champions of the League are honoured by the Dukes by being sent to claim one as their companion in a ritual known as Binding. Man and beast hunt and live together for seven days and after this time, if a bond is formed, the Aralez will serve at the champion’s side as their faithful steed until the death of one of the partners. An Aralez whose champion has died returns mournfully to the plains and lives out the remainder of its life in solitude, never seeking companionship from any other species ever again. The most powerful units of the army, capable of delivering crushing blow to the enemy and to go into war of attrition and holding the foe for as long as it is needed alike. Very versatile elements of the army. They are a bit sower Large Cavalry though so I imagine one needs to be ready to take some charges in. However, with Defense 5+, good nerve and Iron Resolve they may take the attacks head on and still hit back. 3 x 10 Household Knights - The dukes and barons all have stables for the household cavalry and many of the knights are friends and trusted advisors. Three regiments of the knights make for a powerful contingent for sure. 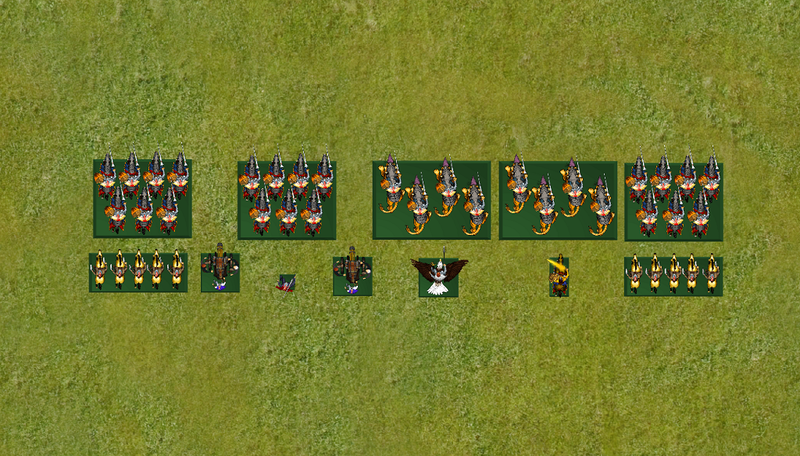 These are your typical heavy cavalry but with a bit of special League of Rhordia flavor. Unlike the knights of other factions, the Household Knights have Fury special rule which means one can guarantee they will keep on fighting. Of course they need to avoid obstacles and difficult terrain to be the most efficient in the charge. 2 x 5 Household Knights - two troops of the knights are also very handy a they are dangerous enough to take care of troop type units of the enemy on their own and can comfortably commit to the fights where bigger regiments or hordes would be an overkill. They can potentially navigate to the flanks a bit easier too. Duke on Ancient Winged Aralez - Rarely, Aralez are born winged and these individuals become the dominant leaders in the family packs. Binding with such an individual is incredibly tough and takes a great deal of endurance on both sides but the honour of succeeding and the lasting friendship that follows if successful is profound. The general of the army, very versatile as is usually the case of a flying hero on a beast. Hits harder than Drakon Lord and magic artifact makes him an expert at hunting down bigger targets. Bloodboil spell adds to the flexibility and would allow to make sure the targets damaged by Volley Guns are eliminated. have some degree of autonomy, still take their orders and swear allegiance to their duke. Another very versatile hero due to the fact that he combines the role of an Inspiring individual but can also add to melee with 4 attacks typical for a fighter. May be instrumental in disordering enemy units where the regiments would not be able to avoid other troops while more maneuverable hero can reach the target easily. 2 x Halfling Volley Gun - Halfling engineering expertise is highly valued in the League and the Volley Gun is a great example of their ingenuity. All League war engines are crewed by both halfling engineer apprentices and human teams. The halflings bring the brains and the humans the brawn. While the Knights and the Guard are offensive elements of the army, two war engines are long range support and defensive counter measures. 15 attacks each with Piercing (2) make for a very potent weapon, also in terms of psychological warfare. The enemies would always need to consider the situation where the Volley Guns unload more than expected average and simply rout entire units in a single turn. 24" range for the war engine is not that long, however so it will be interesting to see them being used. Halfling Master Engineer - Many halflings love to tinker, making cunning tools from simple everyday items. Some are exceptional inventors and take their love of all things mechanical to the cities and the colleges where many have contributed to some fascinating innovations. Later in life they may retire back to their beloved homelands and in recent years some bizarre and experimental farming machines have been introduced although with very mixed results. Most halflings treat these returning wanderers as harmless eccentrics and aren’t quite ready to adopt any new-fangled contraptions just yet. Master engineers often accompany their inventions on to the battlefield to see first-hand how well they perform. They are often seen making minor adjustments or scribbling furiously in their notebooks. The role of Master Engineer is to grant Elite to the already very dangerous Volley Guns. While war engines are fragile, his inspiring presence may save them and definitely increases chances of survival. And being equipped with Long Rifle he can always add these sniping shots against the enemy too. This concludes the presentation of the first of the Australian Masters armies. I hope you liked it and feel free to add any comments about this army! I’m glad you’re doing these write ups! I have not played league of rhordia myself but I am a little familiar with the list. 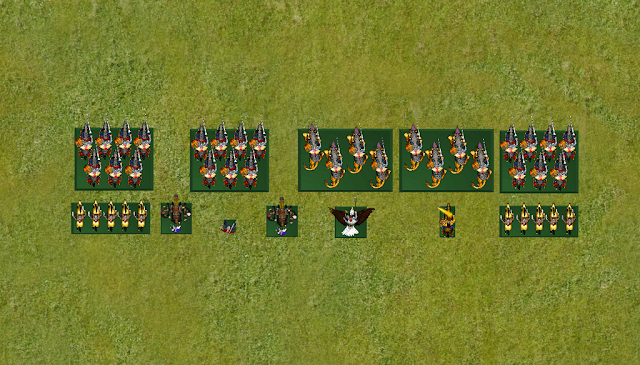 I have plans in the near future of making an all halfling army once I complete the herd. This looks like a fun list to play against. Looking forward to the rest of these! It is definitely good to have variety of the armies represented. Yep thanks for doing this I hope you get time to post the others (but not at the expense of practicing for the comp!). Like you I’ve yet to play against them but have a mass of old 3rd or 4th ed GW halflings that I can see being stripped and repainted in the future. For an superbly painted Kislev themed League army can I recommend swinging by this guys blog. https://mandollies.com. I have no connection with him but know you love we’ll painted miniatures! Thanks for the reminder about great blogs! I saw the reports with the army featured and the blog is in the list of favorites too!